The children here in Portsong constantly ask why my head is rarely found without a cover and you might be wondering the same thing. So please, sit beside me here on the yellow bench and I’ll tell you my story. It may surprise you to know that although my face is full of whiskers, the dome above my beard has nary a hair upon it. This all started when I was but a young Captain in His Majesty’s service in Africa. In those days, I rarely had the chance to look into a mirror. But somewhere along the line, I believe when I was in my thirties, I noticed my forehead had started to grow taller. Being young, I didn’t think a thing of it until my forehead had grown so high it stretched over the top of my head. Within a year, I had lost all of the ruddy hair I had brought into the world. Hearing this, you might assume I now wear hats because I am vain. Rubbish! That is not the case. I don’t at all mind being bald. Since I am told he knows every hair – or lack thereof, I assume I have exactly as many as God intends me to have. Looking down, he sees my head’s reflection much more than I do. If my head is fine by him, then it is fine by me. My zeal for hats came about quite by accident. It so happened, the unit in my command drew a patrol assignment that had us pitching camp in the savannah for a fortnight. We had done this many times. We knew the dangers and how to avoid them. After one particularly draining day, I bedded down under the dark African sky. How I loved sleeping in the open air – the vast grass expanse on all sides covered only by a blanket of deep blue heaven dotted with millions of tiny stars. Wild sounds and strange smells that kept a new recruit awake had become a soothing lullaby to me. On this night, I had no trouble finding sleep and rested comfortably until I was roused by a feather tickling my nose. I opened my eyes to see my alarmed men staring at me, obviously unsure of what to do. When we finally returned to our post, the forlorn bird disappeared and I took up the habit of wearing hats. Not all are for protection, some are simply for style. 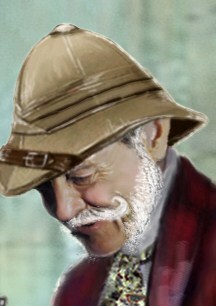 After an incident with a certain young lad here in town, I have often returned to wearing my pith helmet for safety. But that is a story for a different day. And now you know why Colonel Clarence J. Birdwhistle is rarely found without a hat.